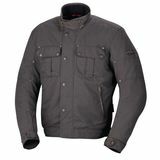 MotoEnthusiast Jacket "Jacket runs very small. Bought a large but may need a xxl! Fiddly collar buckle that is not conducive to moto wear. I have an IXS coat that is my favorite piece of gear but this is not that coat. Sending it back is a pain in the neck too."